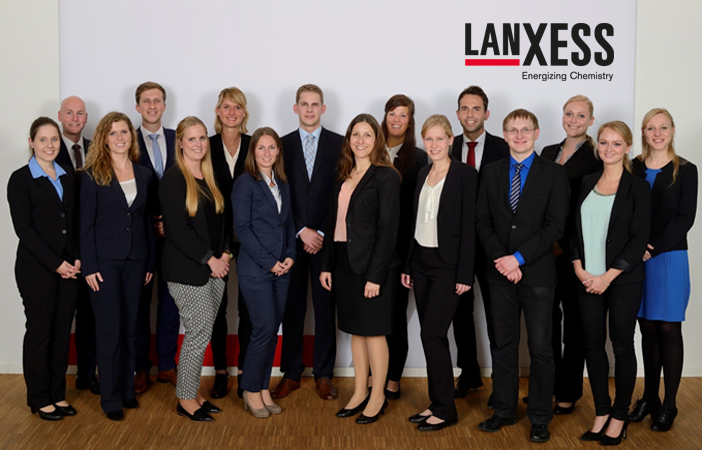 On October 1, 2015, sixteen trainees began their program with LANXESS. For the next 18 months these college graduates will have the opportunity to gain work experience in a number of different corporate areas and face the challenge of getting to know how a multinational company works. Ralf-Ingo Schenkel, Vera Bell and Katharina Znanewitz from our HR-Career Management Department were there to welcome the young executives in Cologne,Germany, and to accompany them throughout their induction week at LANXESS. The high point of a tour of Chempark Leverkusen was most definitely the LANXESS production plant. “Personally, I thought the plant tour was very impressive. I only realized just how vast the production facilities are when I saw them at first hand”, said Saltigo Business Unit marketing trainee Stefanie Gschwandner. The first few days with LANXESS were taken up with teambuilding exercises and an exchange of experience with former trainees. “The time spent with the former trainees was really interesting and informative. After what they told me I am really looking forward to a fascinating and varied time as a trainee”, enthused Janine Au, a Group Function Corporate Controlling trainee. For many of these talented newcomers the highlight of the Trainee Program so far was the three-week-long work shadowing period spent in different German production plants. The aim of the work shadowing period is to familiarize the trainees with our products – including the potential risks they present as regards handling and during manufacture – and to make them understand that production forms the basis of LANXESS’ business activity. Moreover, the college graduates had their first experience of the shift system with all its special pressures and challenges.